Here's a handy link to Canadian video game studios, organized by province. North American attendance for 2010 is expected to drop about 4 percent, to 1.28 billion, according to Hollywood.com, which compiles box-office statistics. Revenue is projected to fall less than 1 percent, to $10.5 billion. It has been propped up by a 5 percent increase in the average ticket price, to $7.85, thanks to 3-D. If the numbers are correct,the number of tickets sold is lower than it has been in any year since 1999. Revenue is down as well, even with the average cost of a ticket rising from $7.46 to $7.85. This implies that the bloom is off the 3-D rose. There have been more 3-D films released this year, yet fewer people are willing to pay to see them. While this doesn't imply the impending death of 3-D, it does imply that 3-D's novelty has worn off. Its revival was just a blip, not a sea change; it will no longer increase box office revenue on its own. It also shows that Hollywood has gone too far in raising ticket prices. While it is understandable that ticket sales should fall during a recession, they have fallen lower than the earlier years of this recession and lower than they've been in more than a decade. Time will tell if this is a trend or just an aberration, but it is something that Hollywood should worry about. A downward trend in attendance is the last thing the film industry needs. The United States Department of Justice has found Pixar and Lucasfilm guilty of restraint of trade. "Beginning no later than January 2005, Lucasfilm and Pixar agreed to a three-part protocol that restricted recruiting of each other's employees. First, Lucasfilm and Pixar agreed they would not cold call each other's employees. Cold calling involves communicating directly in any manner (including orally, in writing, telephonically, or electronically) with another firm's employee who has not otherwise applied for a job opening. Second, they agreed to notify each other when making an offer to an employee of the other firm. Third, they agreed that, when offering a position to the other company's employee, neither would counteroffer above the initial offer. "Lucasfilm's and Pixar's agreed-upon protocol disrupted the competitive market forces for employee talent. It eliminated a significant form of competition to attract digital animation employees and other employees covered by the agreement. Overall, it substantially diminished competition to the detriment of the affected employees who likely were deprived of information and access to better job opportunities. "The agreement was a naked restraint of trade that was per se unlawful under Section 1 of the Sherman Act, 15 U.S.C. § 1." At the same time that Pixar was making Toy Story 3, where the villain hid behind an agreeable facade in order to manipulate others for his own selfish ends, the company was doing the identical thing to its employees. If you have a taste for wading through legal jargon, you can read the official documents here. The Animation Guild blog is now posting a series of audio interviews with members. 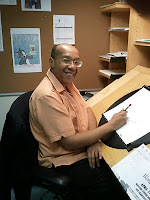 The latest features old friend Dan Haskett, character designer and animator extraordinaire. (And here is part 2.) I first met Dan in New York in the 1970s, where he was one of the most prominent young bloods anxious to restore animation to the glories of the past. For those too young to remember, animation was at a real low point then. Dan has contributed to many major features and TV specials over the course of his career. Earlier interviews are with Ruben Aquino, Bruce Smith (part 1, part 2), Ed Gombert (part 1, part 2), and Robert Alvarez (part 1, part 2). Thanks to the Guild adding labels, a quick link to all the interviews can be found here. I really value interviews with animation artists as the mainstream media (and some recent documentaries) spend too much time focusing on management and not enough on the people who actually create the films. Now that The Animation Podcast seems to be dormant, I'm glad to see The Animation Guild taking up the slack. This is an excellent documentary chronicling the three month tour of South America by Walt Disney and assorted artists at the request of the U.S. State Department. With World War II already underway in Europe in 1941, the State Department was concerned that South America might align itself with the Axis powers, giving the Axis military bases on this side of the Atlantic Ocean. Their response, when the U.S. was still officially a neutral country, was to send cultural celebrities such as Disney (and, separately, Orson Welles) to South America to promote ties between North and South America. This documentary, now on DVD, is written and directed by Ted Thomas, the son of Disney animator Frank Thomas who was one of the artists on the trip. Other participants included Lee and Mary Blair, Jim Bodrero, Herb Ryman, Ted Sears and Norm Ferguson. As all of the participants have passed away, the documentary relies on the memories of spouses, children and grandchildren who have often saved letters from the trip and read from them. Animation historians John Canemaker and J.B. Kaufman add their perspectives. 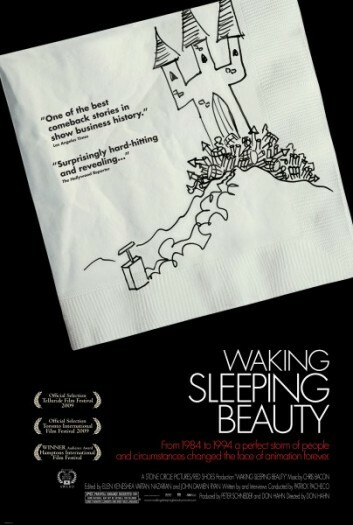 I have to say that I prefer this documentary to Waking Sleeping Beauty. 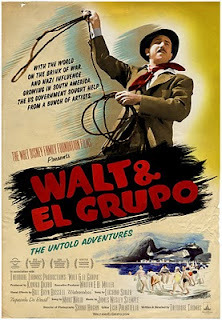 The time period of Walt & El Grupo was a complex one, affected by both world and studio politics. In addition to the threat of war, the trip coincided with the famous strike at Disney and one incentive for Disney's participation was to get away from the studio so that less emotionally involved parties might work out a settlement. Beyond politics, the film is also good at focusing on the artists. We learn of their backgrounds and their contributions to the expedition while seeing examples of the art created during the trip. In this regard, the film is better balanced than Waking Sleeping Beauty. Ted Thomas traveled to the places visited by the group, interviewing surviving participants or their descendants, showing newspaper clippings and movie footage of the time. The trip was well documented, both by the participants and by the local media, so Thomas has a wealth of material to work with. The documentary does reveal that certain live action scenes of the trip used in Saludos Amigos were taken back in Burbank when the editors needed bridging material. (And if my eye doesn't deceive me, they were shot in 35mm where the actual footage was shot in 16mm.) The original release of Saludos Amigos is included as an extra. It's "original" in that it includes footage of Goofy smoking cigarettes, something deleted from later releases in order to protect children. The film has a very large cast and if I have any criticism it's that I wish people were repeatedly identified. Seeing so many adult children of the group, it is easy to forget who they are relatives of. I also wish that more of the artwork produced on the trip was identified by artist where possible. Walt & El Grupo does a good job of capturing a time and place in both world and Disney history. It's a pleasure to spend time with the artists and to see the magnitude of Walt Disney's popularity at the time. Watching this film, I got the feeling that Don Hahn and Peter Schneider made it because they realized their best days were behind them and they were looking to celebrate and mourn the end of their greatest successes. This film covers the period of Disney animation history from the change in management in 1984, when Frank Wells, Michael Eisner, Roy Disney and Jeffrey Katzenberg took over from Ron Miller until Katzenberg's resignation after The Lion King. Because the film is bookended by these two changes in management, the film gives the impression that the rise and fall of the studio during this period was due to the people at the top. While they undoubtedly had a strong influence, such as deciding which films were made, the quality of those films was determined by the literally hundreds of people who created them. Those people are portrayed as bystanders to management politics and the film is curiously selective about who gets identified. I don't believe that Andreas Deja or Eric Goldberg, while they are shown, ever have their names on screen and (except for a deleted clip in the extras) Goldberg is not heard either. I spent a great deal of the film wondering who I was looking at or knowing and waiting in vain for the film to identify them. In an odd way, the film is like a monster movie where giant executives face off while anonymous artists run for cover. Even when the artists are identified, there is no sense of what part they played in the making of the films or their individual sensibilities. The film is fascinating for anyone interested in animation history, but I think that overall the film is a failure. It doesn't explain why the animated features became successful except to talk about management shaking up the animation staff and the presence of Howard Ashman. There is no doubt that Ashman was a major influence in terms of the musical numbers and story construction, but he had nothing to do with the creation of the visuals. Those are left unexplained. The film takes for granted the status of the animated features, measuring them only by box office. There's no further attempt to evaluate them in terms of quality or dissect why some were more successful than others. The management infighting that led to the collapse of Disney animation is spelled out and no one comes off looking good. Once Frank Wells died, the remaining executive team was jealous of each other and couldn't put aside their differences for the good of the stockholders or the art form. The studio may have run out of energy anyway, but it took only seven years from The Lion King to Atlantis: The Lost Empire. For an explanation of that decline, see Dream On, Silly Dreamer. There is one segment in the extras that shows perfectly what's missing from this film. The recording session for The Little Mermaid's song "Part of Your World" was videotaped. Inside the recording booth, Howard Ashman and Jodi Benson work on getting the interpretation right amidst the chatter from the control room. While Benson hasn't yet nailed what Ashman is looking for, her performance is superb. Her voice is beautiful and her phrasing is masterful. Music is more cinematic than animation in that it can be created in real time, but this is perhaps the only example on the DVD of the creative act, the thing at the center of the films that this documentary is supposed to be celebrating. The Disney artists were Benson's equal in their own field, though the film doesn't acknowledge this. No matter how sharp Wells, Eisner, Katzenberg, and Disney were, they were not the ones writing, directing or drawing. In this film, all the glory goes to the jockeys and too little to the horses. It's only the popularity of the films covered in this documentary that justify its existence. Few would care to see a documentary about Hanna Barbera during the same time period. But as this film does little to explain the success of the animated features from 1984-'94, what's left is little more than a souvenir for the crew and those fans with a hunger for a look behind the scenes.